GIVE YOURSELF THE ULTIMATE GIFT FOR THE NEW YEAR! 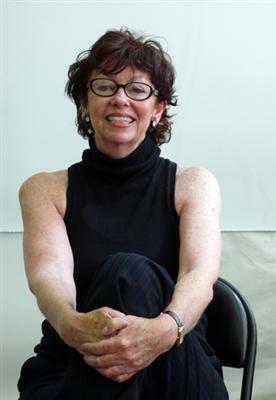 Senior Yoga Instructor Nancy Yates is offering a special series of 3 Private Group Sessions on Fridays, beginning January 11, 2013. – Time 3:30pm to 5:30pm. – Fee: $150 for the entire series of three sessions. Fee for each individual Workshop is $55. – Advanced Registration is required. To reserve your space for the session please contact Nancy directly using her contact info at the end of this post. Payment is made directly to Nancy Yates. This series will be based on Breath awareness. Each session will include extensions, balance, strengthening and restorative postures. Special emphasis on the relationship of opening your Breath and heart during each posture. Special emphasis on restorative postures, including meditations that work for you anytime. Special emphasis on sensing the Breath and learning how to direct the flow of your Breath. Chai & healthy treats will be provided. See you! Goalball players and referees at the tournament. 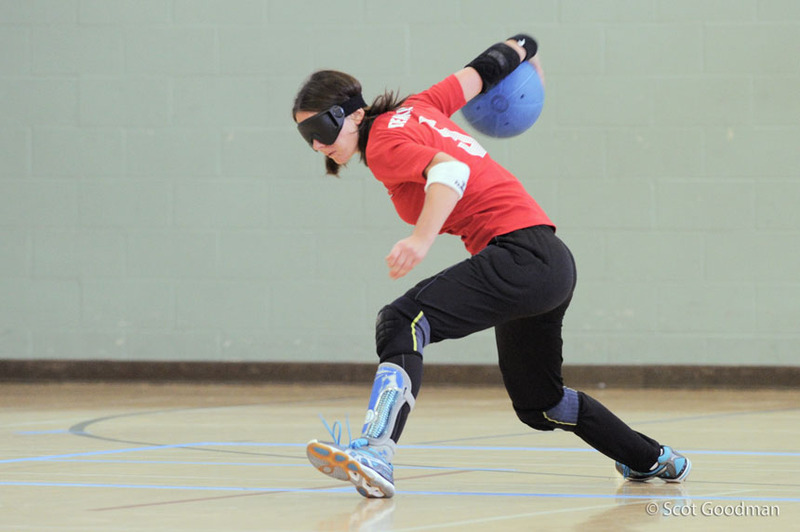 Five teams gathered at James Kenny Gym on November 18 to compete for the 18th BORP Goalball Invitational title. The competition was intense and the Championship game was an all-time classic featuring a dramatic turn-around and a thrilling finish. Green Monsters (Ryding, Gilbride, Lopez, Simeone) couldn’t find an offensive groove and came in 5th. Fist of Fury (Hakopian, Stubbert, Del Toro, Yoo) had an erratic day which cost them defensively and landed them in 4th. Wolverines (Kuan, Johnson, Stokkingreef, Simpson) improved throughout the day and played their strongest game in the 3rd Place final winning the bronze 9-6 over Fist of Fury. Nillasauras (Hamilton, Garcia, Acuna) and Racer 5s (Young, Fisher, Lauridsen) finished 1-2 in pool play and matched up for the final. Racer 5s was hoping to reverse an earlier pool play defeat to Nillasauras and took a 3-0 halftime lead behind 2 goals from Young and 1 from Fisher (including a goal by Fisher with 1 second left in the half). The Nillas showed signs of life with a goal on their first throw of the 2nd half but the Racers quickly answered to keep their 3 goal advantage. Both teams tightened their defenses for the next minute and a half but then the Nillas went on a 3 goal spree and tied the game at 4 with 2.27 to go. The Racers went up 5-4 only 2 throws later but were immediately answered on the next throw to go to 5-5. With 1:14 left the Racers Young blasted a ball into the Nillas goal and a 6-5 lead. However 30 seconds later Nillan Acuna got the tying goal and on the very next Nilla throw with 28 seconds left, Hamilton put the Nillas ahead 7-6 with the winning goal! Post game commentary focused on the all-around excellent play by the women in tournament. Fearless defense and timely offense from the women made a difference in almost every game. Green Monsters’ Ryding led all women in scoring with 6 goals. Nillasauran Christella Garcia had 5 goals and led all players in busted lips and eye-shade checks for her many face-first blocks. 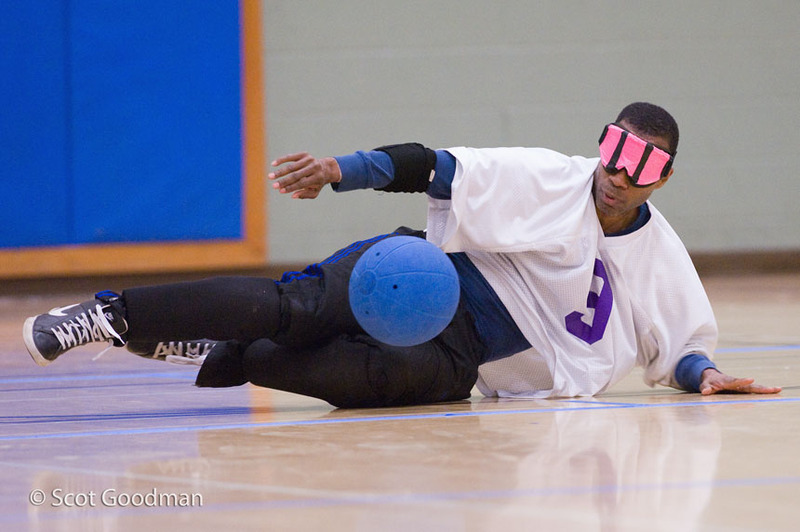 Nillasauras’s Joe Hamilton and Coach Matt Boyle are the first to ever win the BORP Goalball Tournament and a National Championship in the same year. Thanks to the Delta Gammas for their invaluable ongoing program support! Thanks to all the volunteers! As I said at the end of the day, I believe we have the best volunteer support of any goalball tournament I know of. Everyone seems to come with the same positive attitude and interest in making the event the best possible experience for the teams (and the Tournament Director). Thanks to my fellow referees, Lauran and Scott for a great job in their first (but hopefully not last) official BORP goalball competition. Smile! Thanks to Scot Goodman for his full tilt all-day photographic coverage and good-natured management of the group photo challenge. 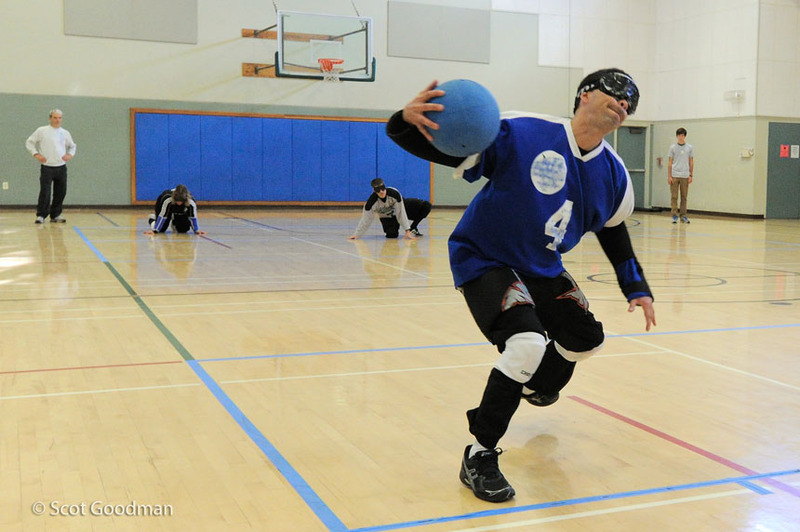 Thanks to Todd Kerr of the Berkeley Times for covering the goalball tournament and his deep appreciation of the athletes and BORP. Thanks to Dawn Nakashima (Nakashima Fine Arts) for another tremendous t-shirt design. 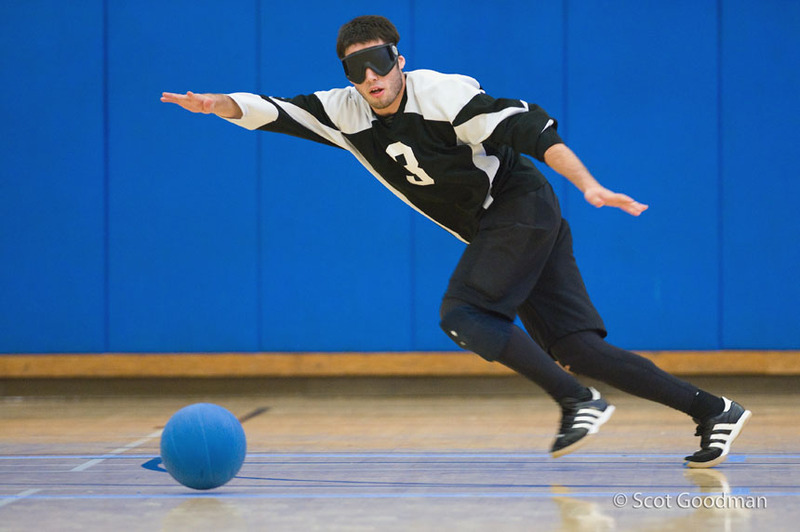 Have a great Thanksgiving and hope to see you at BORP Goalball Invitational 19! Golden State Road Warriors (including BORP participants: Chuck Gill, Trooper Johnson, Mickey Kay, Marcus Oden) will host a tournament in San Jose on Dec. 1/2, 2012. Congratulations to the Bombers and Crushers for their spirited and relentless play today. For the Bombers I especially want to salute their teamwork and never-say-die attitude in games in which they couldn’t find their offense and could easily have given up. For the Crushers I was impressed by the new-found aggressiveness that paid off with lots of offense and a thrilling 1-0 victory over the Kryptonite Pride. While there were many tremendous scores (and near scores) throughout the day, the one that stands out for me was the Bath to Balcziunas goal in the game vs the Pride. This was a precision strike that beat the Pride goalie, a former USA team player, with ease! Luis Campos with some amazing stops in goal for the Bombers. Accolades of the highest order to the Booster Club for the delicious lunch and snacks. The referees for their fair-minded, conscientious management of the games. Our outstanding pit crew for their usual but never to be taken for granted excellent work with everyone’s equipment. Todd Kerr and the Berkeley Times for covering today’s matches. I’ll let you all know when the article is published. Hope everyone has a joyous Sunday and Thanksgiving weekend!